January 26th Show : Blog Of The Nation On today's Talk of the Nation, Ken Rudin and the guests assess the State of the Union, the story of a woman jailed for sneaking her kids into a school outside their district, reunions with long-lost siblings, and Kathy Bates. 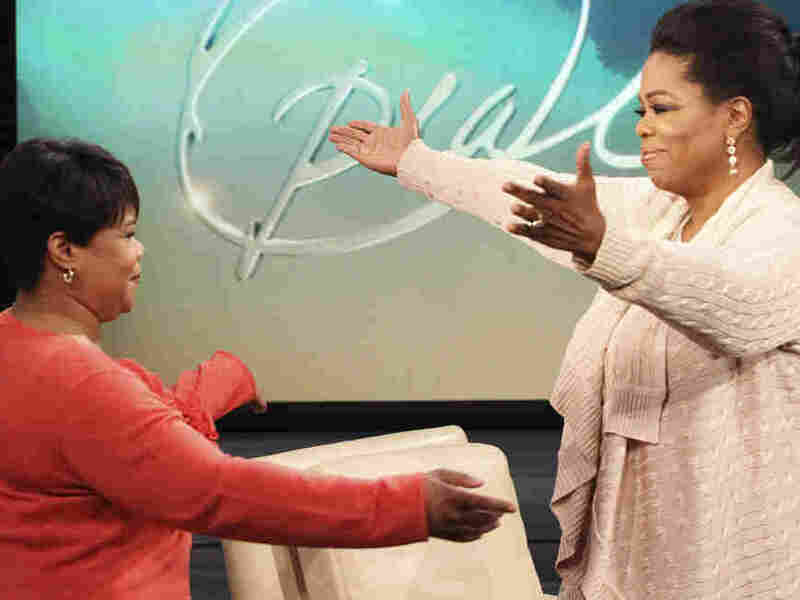 George Burns/AP Photo/Harpo Productions Inc.
Oprah greets her half-sister Patricia on an episode of The Oprah Winfrey Show. The president called for a shift to the middle in his first State of the Union to a divided Congress. The Tea Party has a new leader in New Hampshire, and one of its stars delivered her own response to the State of the Union. And Rahm Emanuel got tossed off the mayor's ballot in Chicago, only to be put right back on. Political Junkie Ken Rudin joins Neal Conan to talk about the week in politics. Rep. Judy Chu (D-CA) will call in to give the progressive's take on the President's march to the middle. And former Republican Rep. Chris Chocola will offer his perspective on whether the President's call to reform corporate taxes is just window dressing. The quality of schools is usually a major factor when parents decide where their family should live. In some cases, a family living in a poor school district will go to great lengths and even break the law to help their kids get a good education. Yesterday, an Ohio mother was sentenced to prison after she was convicted of lying about her residency to enroll her kids in a better school district. The felony conviction may threaten her job. Neal Conan talks to Ed Meyer of the Akron Beacon Journal about the case and whether the punishment fits the crime. Have You Been Reunited With A Long-Lost Sibling? Oprah Winfrey revealed on Monday's show that she had discovered a long lost half-sister. Many others have found and reunited with previously unknown or nearly forgotten brothers or sisters, including Jeff Daly. He lost touch with a sister when he was 6-years-old, only to rediscover her decades later. Host Neal Conan talks with Daly and with an expert in family law about the rights of siblings to maintain relationships through separation by foster care, adoption or divorce. And April VanGesen explains her experiences running Camp To Belong Washington — a summer camp that reunites siblings separated in foster care. Oscar-winning actor Kathy Bates takes her first leading role in a TV series on the new NBC show Harry's Law. Bates plays Harriet Korn, a patent lawyer who is fired from her job. After a series of random and potentially life-threatening events, Harry opens a law practice in an abandoned shoe store in a crime-ridden neighborhood in Cincinnati. Host Neal Conan talks with Kathy Bates about her newest role and her 30-year stage, film and television career.